Left to right: Commissioner Belinda Handy; Judge Kenneth K. So; Judge George J. Abdallah, Jr.
SAN FRANCISCO—The California Supreme Court today announced the reappointment of two current members and the appointment of a new member to fill a vacancy on the Supreme Court Committee on Judicial Ethics Opinions (CJEO), an independent committee that helps inform the judiciary and the public on judicial ethics topics. 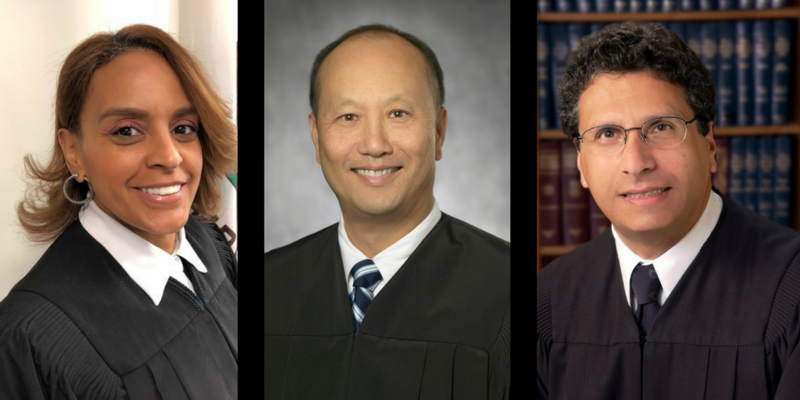 Judge Kenneth K. So of the Superior Court of San Diego County and Judge George J. Abdallah, Jr. of the Superior Court of San Joaquin County were both reappointed to serve additional four-year terms as CJEO members. Commissioner Belinda Handy of the Superior Court of Riverside County was appointed to serve a four-year term. The reappointments and appointment are effective January 1, 2018, through December 31, 2021. As the newest member of the committee, Commissioner Handy will fill a vacancy required to be held by a subordinate judicial officer. (Rule 9.80(c).) She brings to the committee a strong interest in judicial ethics. Prior to joining the bench, Commissioner Handy was an active member of legal communities across the state, having practiced as a public defender in Riverside and Placer counties, and having practiced civil and criminal law in Los Angeles and Fresno counties. As a commissioner on the Riverside Superior Court, her judicial assignments have included family law and domestic violence matters.